You can sing higher if you sing with thin vocal folds. A tilted larynx will help as well and be aware that your larynx needs to lift a little when you sing super high notes. If your throat, tongue and jaw are relaxed, your larynx can move freely. A proper larynx position is crucial! Tilting the larynx a little can be very helpful too! Try to imitate a siren, as high as possible, as long as it feels good and relaxed. For me personally it helps a lot if I act like a hysterical lady, like Carlotta in The Phantom of the Opera. Laughing hysterically also helps to sing your high notes. You also need to thin out your voice. In the video, vocal coach Jesse Nemitz talks about larynx position and thinning out the voice. When you want to sing very high notes, it can help to change your mouth shape. Especially in classical singing, a protruded mouth shape is recommended. 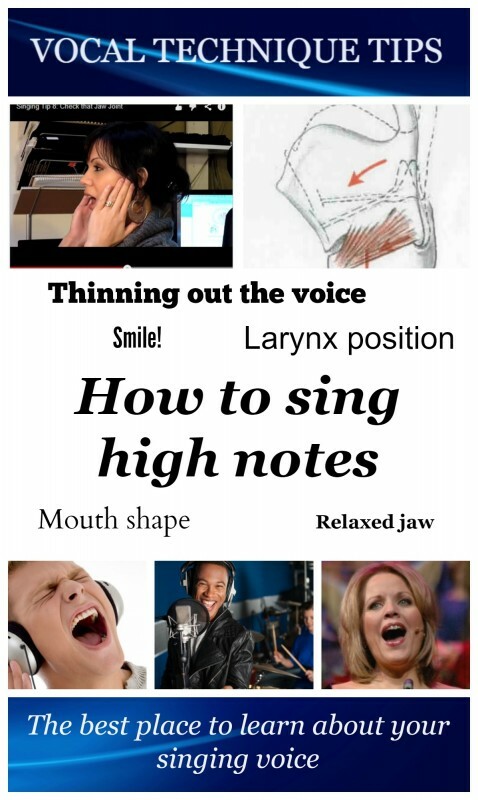 But when it comes to singing very high notes, widening the mouth can be very helpful! A neutral larynx position is very important to sing in the higher regions. Many singers benefit from a slightly higher larynx position when they need to sing in their upper regions. It feels like smiling. But be careful with this! Pushing the larynx upwards with a lot of air pressure is not what is meant here! A voice teacher can tell you the difference! Keep in mind that high notes need a lot of breath support! So make sure your body feels energized when you sing! Sometimes singers tend to stop using breath support. This is not a good thing! Read David L. Jones’ article about light high singing, very important information!!! Some singers use the whistle register or falsetto to reach the highest regions. Singers like Mariah Carey and Minnie Riperton use the whistle register. Falsetto is commonly used by male singers, both in popular and in classical music. Andreas Scholl is a great example. Many singers will experience some sort of fear to sing the high notes. Especially when you are exploring your highest regions, our body will need some time to learn how to stay relaxed while singing higher notes. So relax and give it some time! You should always keep in mind that every voice has its limits when it comes to vocal range. So don’t push yourself beyond the impossible! A voice teacher can help you to explore your voice and determine whether you can sing higher notes or not.